Pasquale Caione established residence in Painesville, Ohio, in 1921. 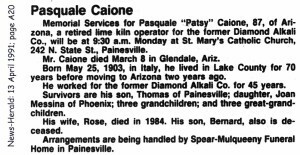 In America, Pasquale Caione was known as Patsy Caione. Pasquale Caione, son of Berardino Caione and Giovanna Calucci, was born on May 24, 1903, at San Demetrio ne’ Vestini, Italy. He married Rosa Messina, daughter of Tommaso Messina and Caterina Graziano, on January 18, 1930 at St. Mary Catholic Church, Painesville, Lake County, Ohio. Pasquale died on March 8, 1991, at Glendale, Maricopa County, Arizona, at age 87. His body was interred at Riverside Cemetery at Painesville, Lake County, Ohio. Pasquale Caione, age 17, immigrated to the United States on February 28, 1921, at the Port of Boston, Boston, Suffolk County, Massachusetts. Pasquale Caione became a citizen of the United States on October 1, 1928. Pasquale resided at 198 Prospect Street, Painesville, Lake County, Ohio, when he was naturalized. Pasquale was employed by the Diamond Alkali Company for 45 years before retiring. He moved to Arizona in 1989 to live with his daughter, Joan.